Learners focus on one challenge a month. Upon mastering the challenge, students receive a stamp. Challenges are arranged in order of difficulty. Vocabulary and phrases are recycled throughout the series. Parents can easily understand what their children are studying each month by checking to see which challenge they are on. Every student goes at his own pace. Some learners do fine with one challenge a month; others can handle two. Japanese translation of ALL challenges is available at the back of each book. 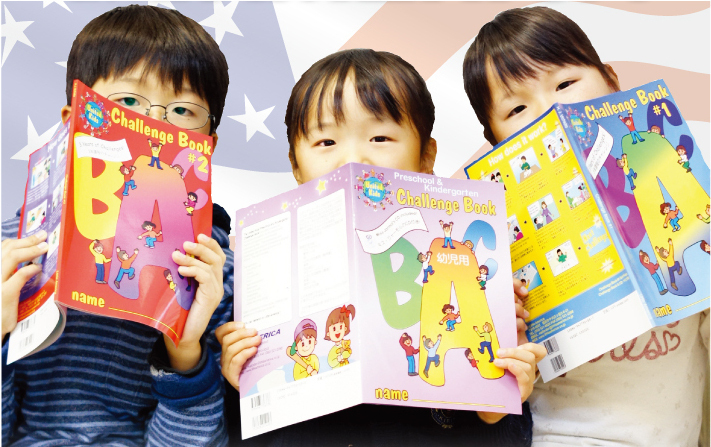 Students can enter an English class at any time and start with the first challenge. Each book has a corresponding CD with Helene Jarmol Uchida speaking (with the exception of Challenge Book #3). Pair work enables students to practice their challenges with each other. Students learn how to do self-introductions with confidence. The user-friendly approach attracts and keeps student interest high. Western culture points and etiquette are introduced at the end of each section. A Certificate of Completion is at the end of each book.